We stayed in the town of Benicàssim for a few days. 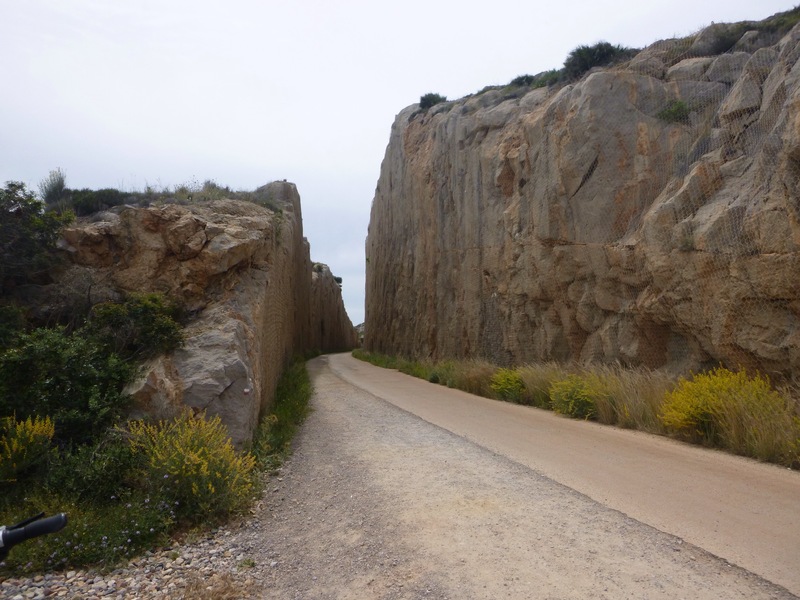 This was a seaside resort on the east coast, about forty miles north of Valencia, protected by a mountain range to the north. The Berbers from North Africa had settled in the area during the 8th century and the town had a Moorish feel. The area relied on tourists and had wide sandy beaches and a long promenade with many high rise blocks of apartments. There were also some beautiful old villas set in mature gardens along one end of the promenade, some of them were quite dilapidated but, looking at them one could imagine a wealthy Spanish family, long before the days of the package holiday, coming out of the hot city to spend time at their villa on the coast. Perhaps these old buildings would be renovated but, more likely, they would be demolished and replaced with more high rise. 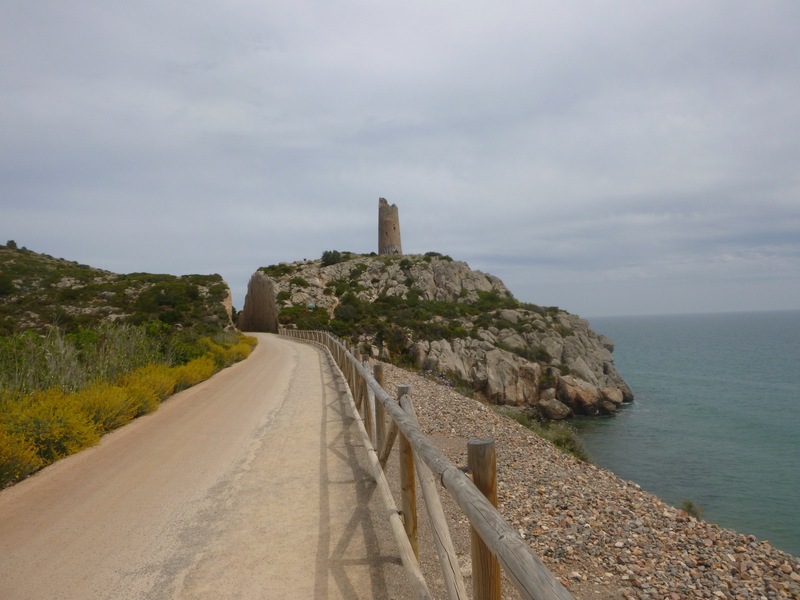 We cycled along the coast to Oropesa six kilometres to the north. We followed a disused railway line that had been converted into a cycle path. 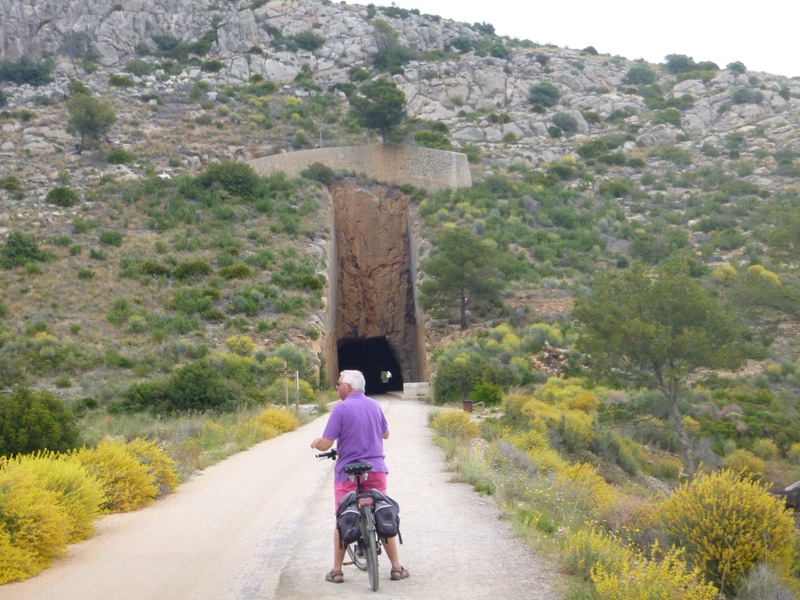 The railway route had been cut into the rock and we had to cycle through a 500 metre section of tunnel where the temperature dropped 5° and it was quite dark and eerie. Oropesa too was spoilt by high rise buildings but had a beautiful beach and there were even a few brave bathers (it was a cloudy day in early May, temperature 25°). We stopped for lunch and, for the fixed menu price of €15 each, we enjoyed a better than average salad with smoked salmon, accompanied by potatoes with garlic sauce. Then we had a delicious stewed pork dish followed by a seafood paella. Dessert was a whole baked eating apple, stuffed with nuts and served with a bitter cherry sauce. Everything was freshly cooked and the portions were small enough so we had enough room to enjoy the dessert. The meal provided a welcome change from waterloged iceberg lettuce salad served with tinned tuna (why? ), quartered very hard boiled eggs and sweetcorn kernels followed by something and chips – this had been our regular fare over the past few days and we were suffering from the lack of fresh vegetables. Unless you ordered a salad starter, restaurants seemed not to offer leafy vegetables at all, not even a tomato garnish. Buying fresh fruit and vegetables in the little town shops also proved difficult, there was little choice and the produce did not look particularly fresh. We decided that perhaps most folk who lived in the countryside grew their own vegetables so there was little demand. Fortunately there was a Lidl’s just up the road from our campsite and there we found a lovely variety of fresh vegetables. I am still living in the delapidated seaside town of Fokkestone and making my daily commute to work at Dungeness. The weather has been windy but the rains have subsided since the weekend. The office was only 16 degrees C this morning so I put the heating on. My food intake is sparse as I am on a diet again. I love the blog, keep it coming, my little ray of sunshine everyday and I have now considering adding extra contributions to my pension pot!